The National Oilwell ("O.W.E.C.O.") well head test rig A below, was re-deployed to 11,500 psi METHANOL and INHIBITOR pumping, to prove injection systems. The fast return / suction stroke of pump B prevented the suction from fully filling. The discharge stroke began with a huge acceleration until the plunger hit the liquid and sent a shock into the system. 1. The pressure set valve C was blasted off its seat. 2. The chart recorder D was ruptured. 3. The certified gauge E immediately lost calibration. From inventory in DUPLEX SS, intercepted the shocking "pulsation". 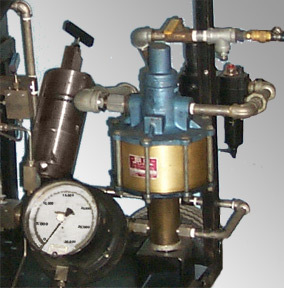 Three day of procedures were then performed with no loss of calibration, nor disturbance of the pressure set valve, and with complete legibility of the chart recorder. 2. A 225% increase in pumpable rate. 3. One year before recalibration was required. Always address the suction system first. Similar PulseGuard Inc And PulseGuard Ltd. Dampers have been in offshore platform service for over 25 years.